Surrounding the whole town are the remains of the medieval wall, which is so well preserved in places that you can walk along it. Within the walls are endless winding streets packed with historic houses, some dating back to the 13th century. Many of the streets are lined with decorative plants in large pots and we just enjoyed walking around and soaking up the atmosphere. 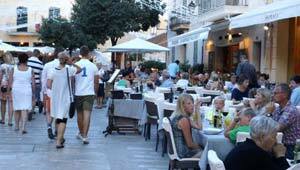 Right at the heart of the town are the two main streets which are lined with shops and eateries and cafes. If you’re looking for good quality food, this is the place to come and there’s a lovely atmosphere in the evening when people fill the outdoor chairs to eat their meals. Another highlight is the church of St Jaume, which is open for visiting most of the time. It’s a nice place to escape the daytime heat, but please make sure you’re dressed appropriately. In the shadow of the church are the roman remains of the settlement here called Pollentia which include a small Roman theatre. There is a small charge to visit the ruins. Alcudia Old Town is usually very busy on Tuesdays and Sundays when a street market takes place all year round. You can walk to the old town from the tourist resort, but it will take up you around 30 minutes. Follow the signs for ‘Alcudia’ from the port.